Made from naturally strong bamboo, these Progress chopping boards have a contemporary design and are the perfect addition to your kitchen. Brilliantly versatile, you can use the boards every day whilst making packed lunches for your children, preparing ingredients for a large family meal or to serve cheese, cooked meats and more when you have guests. With smart handles so you can easily serve your creations, the boards can also be neatly stored away with the attached hanging leather loops. Natural and sustainable, these Progress chopping boards are made from bamboo, stronger than most hardwoods yet brilliantly lightweight. This set of three includes a 30 cm, 35 cm and 45 cm chopping board, their hanging leather loops providing the perfect storage solution. Protect your kitchen worktops from unwanted scratches and stains, simply by using these boards for any of your food preparation needs. 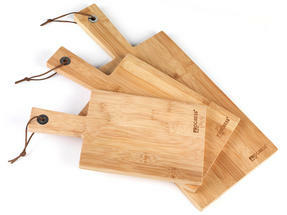 The multipurpose boards are ideal for serving all kinds of foods, featuring strong paddle handles for complete ease and comfort. The oil finished bamboo looks lovely and is incredibly durable – all it needs is a wipe clean with soapy water to keep its quality.